Romantique Guest House- Walk to Melrose! An architectural bungalow with a variety charming interior touches like: High 20 ft ceilings, polished saltillo and handpainted tile floors covered with rich rugs and arched doors and walls. Wrought Iron work, light antiques, original art, with French vintage weaves mixed with contemporary styling. Huge kitchen with breakfast nook and a separate dining area. This Carriage House looks as if it were in a sleek Home decor magazine. This home was recently built and completed with a spacious new kitchen and bathroom, the latest construction. Outdoor dining and a great place for sunshine and the lap top. PARKING IS NOT A PROBLEM! We offer free parking permits for our quiet residential area. Touches including turn of the century French pressed glassware, place settings and stemware for the old world flavor but are seamlessly blended with every modern necessity. Best of all is the location . 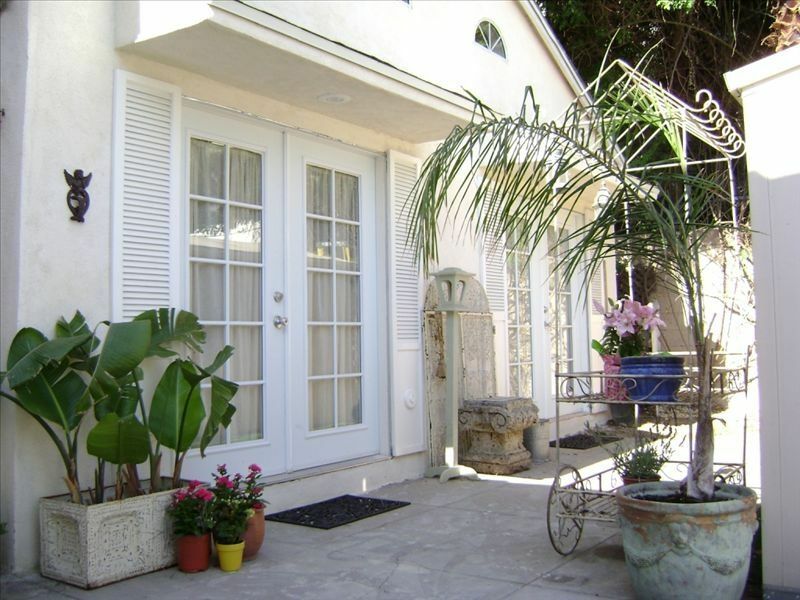 This cozy retreat is only steps away from LA's Trendy Melrose Ave and all the glamorous boutiques near Robertson Blvd. and the home design area of La Brea. A Distinctive newly built Carriage House reminiscent of an era past. It is beautiful yet comfortably furnished for long or short term lease. Great for a couple. Nestled at the base of the famous Vista Street hike of Runyon Canyon- climb to see far reaching views of the Hollywood sign to the ocean and skyline...breathtaking. We are just minutes from the heart of Hollywood! Hollywood and Highland is the happening place..so much to see and do. Two minute walking distance to Trendy and fun Melrose Avenue- the boutiques, cafes, ice cream parlors, Groundling Theater for live Comedy Shows, famous restaurants... Carlitos Gardel Restaurant , Village Idiot, Pinks Hot Dogs, The Old Hollywood famous Movie Star haunt-- The Formosa-- all these restaurants are walking distance. Short drive to Urth Cafe, INK, Animal, Lucifer's Pizza, Sweet Lady Jane, La Brea Bakery, Saddle Ranch, Boa , The Grove with all the variety and The old Farmer's Market. The list is endless! Santa Monica Blvd is 2 blocks from the home leading into central West Hollywood, onto Beverly Hills, Century City-- and down to the beaches of Santa Monica, an easy drive to the West. Bedroom sleeping- Queen pillow top yummy mattress, Additional available is twin rollaway or Aerobed in full size for extra sleeping. Wonderful - spacious- and cozy. This delightful mini- home is embellished with refined fabrics of textured Irish linen weave drapes and matching antique chairs, Scrolled ironbed and period tables, New appliances in kitchen and big bath which boasts the French bistro style furnishings with sheer sunlight window coverings, European comforters and duvets, 600 thread count 5 star hotel bedding. Flat screen HDTV. High ceilings and sky lights give this home an airy bright effect. (additional Areo bed available). Free standing home that speaks of a high style of living. Outdoor dining with French Doors to lovely architectal bungalow. Wonderful-spacious- and cozy. Two indoor dining aeras & outdoor al fresco dining table too.This delightful mini- home is embellished with refined fabrics of textured Irish linen weave drapes and antique chairs, Scrolled ironbed and period tables, New appliances in kitchen and big bath which boasts the French bistro style furnishings with sheer sunlight window coverings, 2 new pillow-top twin-size mattresses /or a king bed with a one piece mattress, European down comforters and duvets, 600 thread count 5 star hotel bedding. Flat screen HDTV. High ceilings and sky lights give this home an airy bright effect. (additional Areo bed available).Free standing home that speaks of a high style of living. Outdoor dining with French Doors to lovely architectal bungalow. Perfect for a hip couple, a .private single or small family. Charming, romantic, has everything you might need. We had a great stay! We had a great stay! The bungalow unit is charming, tastefully furnished, warm and cozy. The location is great. We will come again for sure! West Hollywood, accessible to everything. Clean. Private. Relaxing. Wouldn’t hesitate to re visit! Cute, nice neighborhood, near food and shopping, great location. The guest house was clean and thoughtfully decorated. The patio was pretty, and the location couldn't be better, close to Melrose Ave. Treesa sent valuable information the day before, codes, locations of farmer's markets, places to visit. She was available to answer those last minute questions and had left clear instructions. Anyone who lives in Calif. knows that conserving water is important and so no long showers. Overall, my friend and I would definitely go there again. I was in town for downtown event, but did not want to stay on DTLA. This location in West Hollywood was two blocks off Melrose and close proximity many places, and it only took me about 25 minutes to get downtown each day of my event. This is a lovely location in a very nice and safe neighborhood. Because it is set off from the street in a courtyard-type setting, it is very quiet and private. The next time I am in L.A., I just plan to stay here again. My elderly mother and I stayed in this darling carriage house while visiting my son. It was very easy to access, close to my son's house, and my mother was able to navigate the small step into the bungalow. We really enjoyed the basket of goodies and we look forward to staying here next year. All of my questions and concerns were answered promptly. It was very close to the Grove/Farmer's market that we visited frequently. The location was perfect!! Walk to trend-setting Melrose Avenue only 2 short blocks away and visit world-famous celebrity-haven-Fred Segal, Maxfield, Jonathan Adler, Nanette Lepore, Marc Jacobs, Cynthia Rowley, and John Varvatos just to name a few. Melrose Avenue boasts of Bodhi Tree Bookstore and the Pacific Design center. After a day of shopping, drop off your bags and stroll to some of L.A.’s hottest restaurants and clubs including Urthe Caffe, Ago, Morton's, Mazzo, M Cafe, Asia de Cuba , Ketchup, Red O , Spago, Lucque’s,The Groundling Theater, The Palm, The Improv, The House Of Blues, Katsua, Cafe La Boheme, The Green Door, Chateau Marmont, and Koi.